Was lucky to be invited to the Singapore launch of US-based Vita Coco's cold pressed organic coconut oil on Wednesday! Vita Coco's coconut water has already won the hearts of millions internationally since it's processing from fruit to packet ensures that drinking from the packet is almost like drinking from the nut itself. The humble coconut has been heralded as a wonder fruit and thus, this jar of coconut oil has been aptly called the 'little jar of wonders' as coconut oil is packed rich with good fats (medium chain fatty acids) and acids (Capric, Caprylic and Lauric) which nourish, energise and stimulate your body’s metabolism. In fact, the only other natural source of such a large quantity of these rich fats and acids are in mother’s breast milk, which strengthens the immunity of her baby. Due to the wonders of coconut oil, the running tagline for Vita Coco is "Eat it. Wear it. Swear by it!". Let's touch on the "Eat it" portion as food is always close to the heart. Here I am enjoying a glass of Coconut Margarita and mind you, this was my 2nd cocktail. I had earlier drunk a glass of Coconut Water Mojito! Yummy and refreshing! There were mocktails too but I wasn't driving so bring on the alcohol! 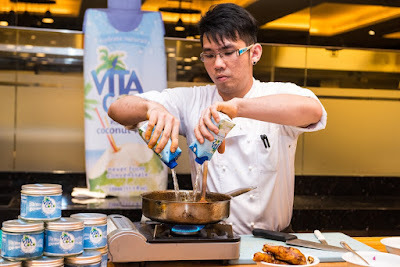 The team had engaged the chefs at Glass House, Hotel Fort Canning, to come up with a 3 course meal to showcase the variety of ways that Vita Coco's coconut oil and coconut water could be used in one's cooking. First came a simple salad of baby spinach, tomato, cucumber, roasted walnuts, mandarin orange slices drizzled with some coconut oil. The result was very refreshing and it was interesting to smell the coconut but not eat something that is very rich but light. Second course was the chicken soup that was cooked with coconut water. It was a bit too sweet for my liking and I reckon that it's because the chef added sugar and not because of the coconut water. I've cooked broth with coconut water before and it tastes really yummy, especially when you mix it with chicken broth as the coconut water adds another dimension to it. Alternatively, I feel that coconut water is a good vegetarian broth! Just remember to add the salt. Lastly is Coconut Butter Chicken with Savoy Coconut Rice. It uses both coconut oil and water as part of the ingredients. We had a cooking demonstration as well! Chef taught us how to prepare the Coconut Butter Chicken dish and if you'd like the recipe, you can head on over to my other blog In Chef Mode to download it. As mentioned earlier, coconut oil is versatile and not only can you eat it, you can use it and this brings us to the "Wear it" portion. I'm currently using Coconut Oil in what is known as oil pulling. Basically, you gargle with coconut oil for about 20 minutes before brushing your teeth. This 'pulls' the bacteria and dirt in your mouth due to the anti-bacterial properties of coconut oil. I've done it for about a week or so and what I like about it is that it doesn't dry my mouth and lips, unlike normal mouthwashes. Due to its moisturising properties, you can use the coconut oil as a body scrub by mixing it with rock salt or sugar. Also, you can use it as a harmless and effective makeup remover! Another way of using coconut oil is a hair conditioner, just like how a lot of Indians use it traditionally. If you have fine hair, it is also advisable to coat your hair with coconut oil before shampooing. Called a 'pre-poo', this prevents your hair from getting dried out during the shampoo process. You can get more information and tips on how to use coconut oil at http://www.swearbyit.com. So where can you get your hands on this little jar of wonders and the refreshing coconut water? The 250ml Vita Coco coconut oil is retailing at S$20 and will be available at all major supermarkets and specialty stores from November 2015 onwards. The coconut water are already on sale in the major supermarkets! To find out more about Vita Coco and their nutty story, visit http://vitacoco.com/sg.